On November 7, 1968, a group of fifteen retired teachers met at the Black Angus Restaurant in Kalida with Mr. O.J. Frederick of Findlay for the purpose of forming an organization that would support retired teachers. At this first meeting it was established that meetings would be entertaining and informative in nature and include legislative topics pertinent to the members. The organization has grown from these first 15 members to 160 local members. The Executive Committee meets four times per year. The entire membership has four meetings a year at various locations around the county. Examples of our meeting programs are presentations from counselors from State Teachers Retirement System (STRS) and from the Ohio Retired Teachers Association (ORTA) speaking on such topics as cost of living, medical care, legislative issues, and other retirement topics. Since 1994 the December meeting has been our Christmas celebration. We also schedule speakers who present different social topics of interest to all. Currently our committees are Community Participation, Legislative, Membership and Pre-Retirement Planning, Protective Services, and Public Relations. 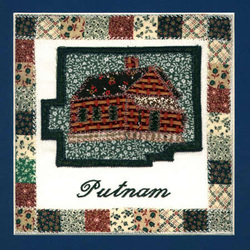 The one-room school house chosen for the motif of our quilt block is Bridenbaugh School located on Road 6, north of Pandora in Putnam County. Every township had a one-room school that had inspired many present day retired teachers. This one-room school is included in the book, Putnam County, OH – One Room Schools, edited by Mary L. Sheeley, a charter member of the PCRTA. Today, this school house is visited by many students on field trips to learn about the history of education in Ohio.